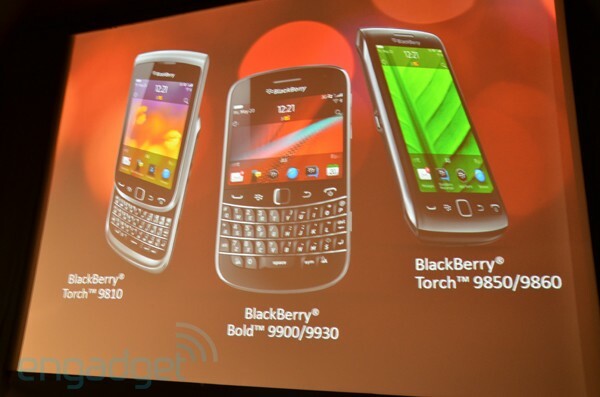 RIM launches BlackBerry Torch 9810, Torch 9860 and Bold 9900, we go hands-on! Here they are folks. Months after we first got our hands on pre-release Torch and Bold Touch handsets, RIM is finally ready to show off its latest hardware. They're all powered by a 1.2GHz processor, have 768MB of onboard RAM and -- most importantly -- run the latest operating system BB OS7. RIM claims its new OS is 40 percent faster at browsing compared to OS6-based smartphones, and 100 percent faster than OS5 handsets. It also supports RIM's Liquid Graphics technology, which uses a dedicated graphics processor for smoother scrolling, zooming and panning. Hands-on impressions and video follow after the break.